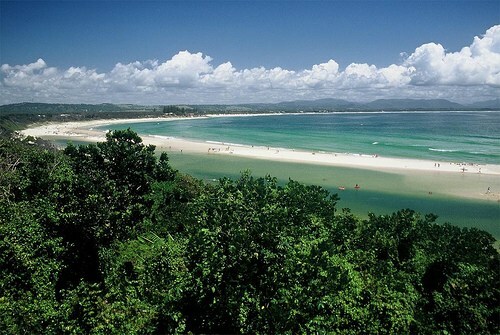 Main Beach is directly in front of Byron Bay. 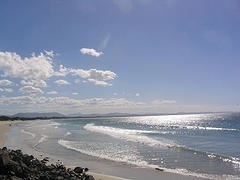 It starts at the car park opposite the Beach Hotel and runs southeast towards Clarke's Beach and the lighthouse. The beach is dominated by the Surf Club and is patrolled by Surf Lifesavers in summer, so is always popular with young swimmers and families. You can walk all the way south -actually southeast- through Clarke's Beach and down to 'The Pass' where there is a lookout built up over the rocks - a great place to look back up the Beach towards Byron and watch the surfers at the Pass. You can also do the bush walk up to the lighthouse which is a nice walk through bush and remnant rainforest. It's a bit of a hike uphill but there is seating along the way and the forest, views of Byron and the ocean are worth it - plus you get to visit the most easterly point of the Australian mainland. There is no cafe at the lighthouse but there is a Gelato bar open during the day and a souvenir shop. You can drive up and park near the lighthouse for a small fee if the walk seems too much. There is a cafe and restaurant at the Pass, as well as a car park. To get there by car from the centre of Byron, head towards the lighthouse which is well sign-posted and turn off for the Pass. From here you can snorkel out to the Tassie II , a shipwreck just off the coast. Dogs are not allowed on Main Beach. The only beach in Byron where dogs are allowed is the southern end of Belongil Beach, from the main Car Park up to Manfred Street.